Chocolate lovers will celebrate this deluxe collection of decadent sweets including white chocolate cranberry cashew bark, milk chocolate caramel pean clusters, chocolate sea salt caramels, chocolate dipped apricots, chocolate covered pretzels, grahams, OREO cookies and much more! A truly impressive gift that will be remembered. 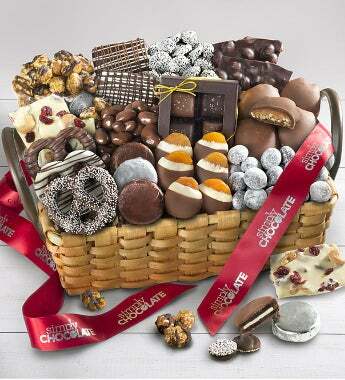 Beautifully presented in a wood slat basket tied with Simply Chocolate ribbon. Chocolate lovers will celebrate this deluxe collection of decadent sweets including white chocolate cranberry cashew bark, milk chocolate caramel pean clusters, chocolate sea salt caramels, chocolate dipped apricots, chocolate covered pretzels, grahams, OREO cookies and much more! A truly impressive gift that will be remembered.